The joint SHC Task 40 / EBC Annex 52 project Towards Net Zero Energy Solar Buildings has been one of the largest of the Technology Collaboration Programmes IEA Solar Heating and Cooling (SHC) / Energy in Buildings and Communities (EBC). As many as 86 experts from 19 countries collaborated in this project, which ran between October 2009 and October 2013. 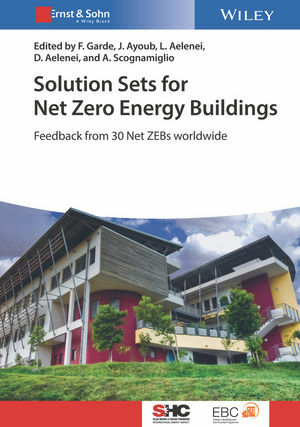 This April saw the publication of a book titled Solution Sets for Net Zero Energy Buildings, which presents 30 case studies of Net Zero Energy Buildings (NZEB) from all around the globe. The structures discussed range from single- and multi-family property to educational and office buildings. The authors explain what design challenges climate and building type posed and to what extent the differing designs have been successful in meeting these challenges. Each building discussed in the book has been monitored for at least 12 months to confirm its net zero output. “With 19 countries involved, we could not come up with one single definition of what constitutes a Net Zero Energy Building,” Ayoub said. But it became clear that there is one basic factor that is widely recognised among commercial and industry partners, namely that a Net Zero Energy Building is usually connected to a grid and generates as much energy per year as is being consumed on site. In a position paper of Task 40, the authors also said that it was necessary to reduce the mismatch of supply and demand in order to lessen the impact on grids (link to http://www.solarthermalworld.org/content/position-paper-actions-needed-pave-way-net-zero-energy-buildings). Such an approach would require a high level of energy efficiency, smart control, load management and on-site solar energy use. The basis for calculating the annual energy balance varies by region and point of view. Task 40 identified four methods: NZEB Limited, NZEB Primary, NZEB Strategic and NZEB Carbon. Particularly NZEB Limited and Primary are calculated based on the primary energy use in the building. An NZEB Limited balance only considers heating and hot water demand, but not electricity for lighting, appliances and other loads specified in the Energy Performance of Buildings Directive 2010/31. NZEB Carbon defines the balance based on equivalent carbon emissions. It includes all consumers and producers on site and considers both on-site and off-site energy generation. The NZEB Strategic definition is less stringent than the others. It allows the combination of different methods to arrive at a balance. The task website offers a free Excel-based tool which allows for a relatively easy project evaluation based on all four NZEB definitions in comparison (link to http://task40.iea-shc.org/net-zeb). The book, which focuses on solution kits, is the last of three published based on the work of Task 40. The first came out in November 2012 and was titled Net Zero Energy Buildings: International Projects of Carbon Neutrality in Buildings; the second called Modelling, Design, and Optimization of Net Zero Energy Buildings followed in March 2015.